After learning what an Orange Widget is and how to define them on a toy example, we will build an semi-useful widgets that can work together with the existing Orange Widgets. We will start with a very simple one, that will receive a dataset on the input and will output a dataset with 10% of the data instances. We will call this widget OWDataSamplerA (OW for Orange Widget, DataSampler since this is what widget will be doing, and A since we prototype a number of this widgets in our tutorial). Note that we declare our orangedemo package as containing widgets from an ad hoc defined category Demo. 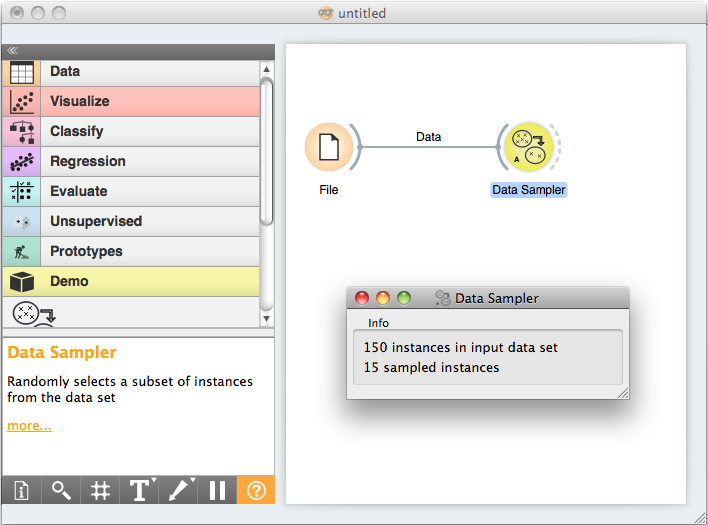 description = "Randomly selects a subset of instances from the dataset"
The widget defines an input channel “Data” and an output channel called “Sampled Data”. Both will carry tokens of the type Orange.data.Table. In the code, we will refer to the signals as Inputs.data and Outputs.sample . Channels can carry tokens of arbitrary types. However, the purpose of widgets is to talk with other widgets, so as one of the main design principles we try to maximize the flexibility of widgets by minimizing the number of different channel types. Do not invent new signal types before checking whether you cannot reuse the existing. As our widget won’t display anything apart from some info, we will place the two labels in the control area and surround it with the box “Info”. The next four lines specify the GUI of our widget. This will be simple, and will include only two lines of text of which, if nothing will happen, the first line will report on “no data yet”, and second line will be empty. In order to complete our widget, we now need to define a method that will handle the input data. We will call it set_data(); the name is arbitrary, but calling the method set_<the name of the input> seems like a good practice. To designate it as the method that accepts the signal defined in Inputs.data , we decorate it with @Inputs.data . The dataset argument is the token sent through the input channel which our method needs to handle. To handle a non-empty token, the widget updates the interface reporting on number of data items on the input, then does the data sampling using Orange’s routines for these, and updates the interface reporting on the number of sampled instances. Finally, the sampled data is sent as a token to the output channel defined as Output.sample . Although our widget is now ready to test, for a final touch, let’s design an icon for our widget. As specified in the widget header, we will call it DataSamplerA.svg and put it in icons subdirectory of orangedemo directory. With this we can now go ahead and install the orangedemo package. We will do this by running pip install -e . command from within the orange-demo directory. Depending on your python installation you might need administrator/superuser privileges. Try opening different data files (the change should propagate through your widgets and with Data Table window open, you should immediately see the result of sampling). Try also removing the connection between File and Data Sampler (right click on the connection, choose Remove). What happens to the data displayed in the Data Table? For debugging purposes, we want to be able to run widgets standalone: if the file with the widget code is executed as a main script, it should show the widget and feed it some suitable data. The simplest way to do so is to use Orange.widgets.utils.WidgetPreview and pass it the data for the default signal.